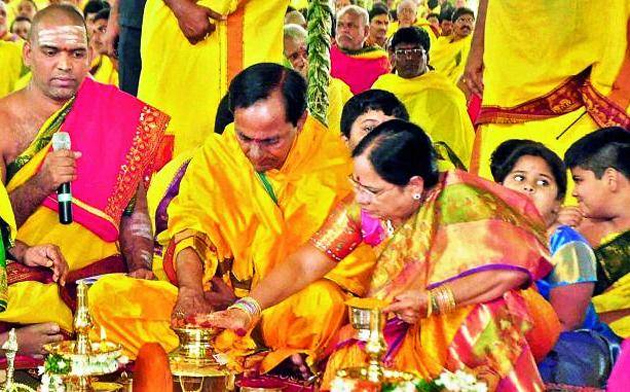 Telangana CM K Chandrasekhar Rao & his wife Shobha performed Raja Shyamala Chandi Homam at their farmhouse in Erravalli on Sunday to win the upcoming Assembly Polls. If the buzz is true, TRS Supremo would perform Chandi Sabhitha Rudra Homam as well before the elections. While KCR's Family takes part in the first yagam, TRS Senior Leaders will participate in the second yagam. Over 100 pundits have been hired for these homams. KCR is a firm believer of auspicious muhurats, horoscopes and yagams. In 2015, The Chief Minister had conducted Ayutha Chandi Yagam at his farmhouse on a grand level. TRS Chief is so sure of his party retaining power with 100 seats. He feels Mahakutami-led by Congress will be of no use. Still, CM wishes to seek the blessings of god for continuing the development.